As I am working my way through the Love At First Stitch book from Tilly & the Buttons, my next project was to be the Delphine skirt. The skirt is a simple a-line skirt with a certain amount of structure. I chose to use some fabric that I had found at an estate sale; very cheap as I got the full box of fabric for $5. I can’t even describe this fabric because I’m RUBBISH at recognising fabrics. All I can tell you is that it is woven, quite thick and makes my scissors fluffy! I set out cutting the material and it worked perfectly with the small amount of fabric that I had. I just had enough interfacing left to use too. I cut a size 5 for this, despite my hip measurement being closer to a 4. I thought it would be better to match the pattern to my waist as that is where the fastening would sit. I was really impressed with how the skirt came together to start with. Overlocking was a breeze and it resembled a skirt very quickly *happy dance*. I inserted an invisible zip and it was invisible! My last attempt at inserting an invisible zip was successful as the zip looked fabulous, it just wasn’t invisible. I concentrated more this time and managed to do it using only a normal zipper foot. 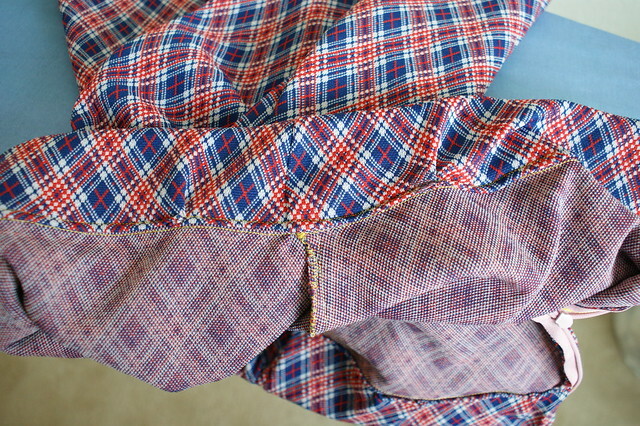 For me the trickiest part of the construction was attaching the waistband facing. 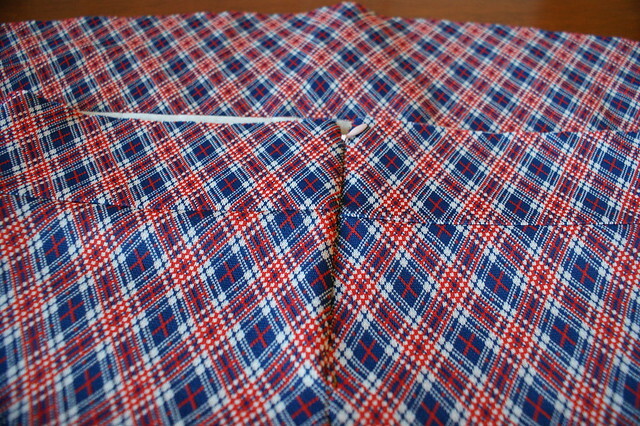 I had already put a couple of folds in the skirt when attaching the interfaced waistband as the 2 didn’t match up properly. This happened again when I attached the waistband facing 😦 I don’t think that my stretchy material helped as it did stretch slightly when it went through the machine. 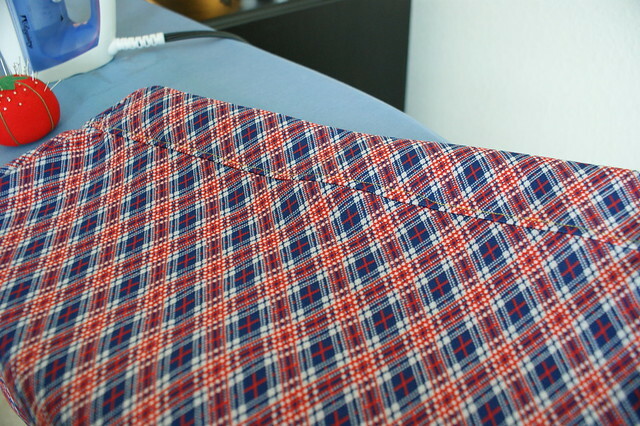 I just made sure that the seam lines were matching and trimmed the excess that overlapped the zip. I liked the part when the facing was flipped to reveal neat little corners where the invisible zip finishes (even though one side was higher than the other!). My biggest problem with this make was attaching the bottom of the facing to the skirt…to make it look nice and neat. The fabric was far too stretchy and I had managed to melt a big piece of it when I was pressing! :-0 I was so close to finishing it and I just couldn’t possibly think about unpicking it all, so I made do. From the outside, the stitching is just very a little wobbly and a little bit obvious as I had set out using yellow thread! On the inside, it looks like a dog has chewed it but hey ho… who else will be looking at my inner waistband! I’m still not sure about the fitting. I love the style on everyone else I see but I’m just not sure if this looks very flattering on me. I feel like the waistband sits off me slightly and it doesn’t do anything for my bigger hips. Saying that though, I feel that if I made any of it any smaller it just wouldn’t be as comfortable! Maybe this is one of those items that I wear until I feel like it looks ok! Apologies for the terribly lit photographs! That looks cute on you! It sounds like your fabric may have a little stretch, so you could try taking in the waistband a little, as it might stretch out as the day goes on. 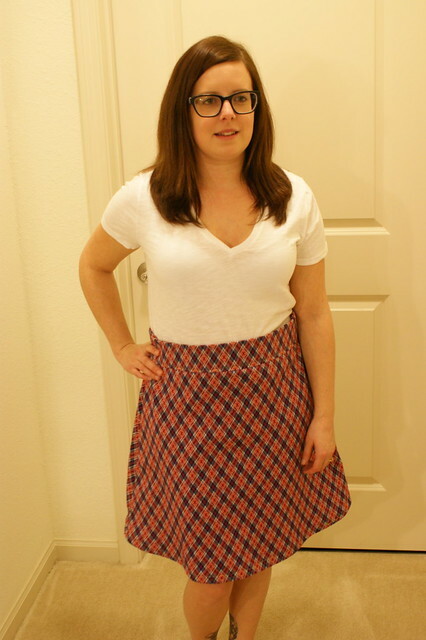 I like the way those wide waistbands look, but I find them a little difficult to wear, as the top of the waistband always winds up at my waist, but the bottom–where the skirt naturally draws in–falls below my waist. Yes it has lots of stretch! I may use a lighter interfacing on the waistband facing too for extra stability! I think I need to wear it a few times before I decide properly! The plaid is great, and I agree with the first commenter. The waistband can probably come in a bit. I think you did yourself a favour with the fit – now you’ve got space for more honey BBQ crisps 😛 I think it looks great anyway. I think it suits you very well! I would definitely consider taking the time to make the waistband smaller though, the stretch in the fabric will mean it’s still comfortable to wear. Who looks at the inside anyway! The fabric is very cool! Maybe the waist is a little big though? Pingback: Talented Tuesday Link Party #14 - Cook. Craft. Love.